And Then Press, 9780615498089, 236pp. 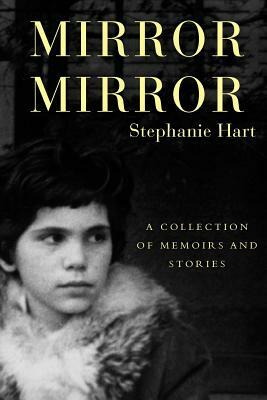 Mirror Mirror: A Collection of Memoirs and Stories, Stephanie Hart's third book, is composed of a series of fast-paced vignettes that explore her childhood, youth, family, and ancestral background through a mix of real and imagined memories and events. She recounts and interprets the unique details of her own life, bringing to life the personalities and experiences of various relatives and friends in an intimate, heartbreaking, and often humorous manner. Her rich prose is evocative and poetic, yet highly accessible and engaging. Her story becomes a window into many lives, lives most readers will find reflected in their own personal narratives, encouraging them to revisit and re-imagine their own family backgrounds. Seamlessly blending past and present, Stephanie takes us from Manhattan of the 1950s to Moscow and Odessa circa 1800s, where she imaginatively renders the lives of her grandparents and great grandparents, and then takes us into the twenty-first century. She bares her soul by inviting readers into her world: her magical and unsettling early childhood by the sea, her years spent as the only Jewish girl in a Presbyterian boarding school, her urban high school years during which conflict with her mercurial and charismatic mother reaches a crescendo, and the weight of her father's anger and unrealized dreams press down upon her. While acknowledging the mirror of the past, she shows us the love and friendship reflected in her current life, celebrating the generative power of each moment to transform experience. Editorial Reviews: Reflective readers, who seek artistic healing of the common hurts of growing up and growing older, will find that Mirror Mirror speaks powerfully. The] consistent, nostalgic tone gives the book a savoring, contemplative speed. Each chapter is laden with vivid yet sometimes enigmatic images, alluring readers with crisp evocations of mood and poignant descriptions of characters. R]eflective readers, who seek artistic healing of the common hurts of growing up and growing older, will find that Mirror Mirror speaks powerfully. Foreword Reviews Hart's memoir charts her psychological process of overcoming a painful childhood. This bittersweet collage of memories is categorized into five sections. Hart's lyrical, well-paced prose saves her story from falling into the poor me category of memoirs. Her smooth writing style, sharp insights and eye for detail make her family problems compelling. But while interesting separately, the somewhat fragmented vignettes are more significant because Hart has rendered them into a complete picture. Indeed, this collection illustrates Socrates philosophy that the unexamined life is not worth living. Each section reads as though she intuitively regressed to capture the emotional mindset of whatever age she was recalling. She also reveals how she rose above the negativity and eventually realized her authentic self. The stories culled from her memory, as well as the way in which they re analyzed and organized, map a process of overcoming childhood adversity. A hopeful, finely rendered portrait of a dysfunctional family and its effects on the author. Kirkus Reviews About the Author Stephanie Hart teaches writing at the Fashion Institute of Technology and Parsons The New School for Design in New York City. Hart is also the author of Clouds Like Horses and Other Stories (which contains some of the stories of Mirror Mirror) and the young adult novel Is There Any Way Out of Sixth Grade? A member of Poets and Writers, and the Authors Guild, her stories and essays have appeared in anthologies such as Mondo James Dean, The Best Stories from ducts.org, and literary magazines including The Sun, Jewish Currents, And Then, and ducts.org. For more information, visit: mirrormorrorhart.com.